Sydlynn Hayle’s life couldn’t be more complicated. Trying to please her coven, starting over in a new town, and fending off a bully cheerleader who hates her are just the beginning of her troubles. What to do when delicious football hero Brad Peters–boyfriend of her cheer nemesis–shows interest? If only the darkly yummy witch, Quaid Moromond, didn’t make it so difficult for her to focus on fitting in with the normal kids. Add to that her crazy grandmother’s constant escapes driving her family to the brink and Syd’s between a rock and a coven site. Forced to take on power she doesn’t want to protect a coven who blames her for everything, only she can save her family’s magic. If her family’s distrust doesn’t destroy her first. “A great, inventive plot, a deeply flawed, self-deprecating, heroine . . . What more could you want?” — Amazon reviewer Hobbitual. Patti is an award-winning author with a passion for the paranormal. Now with multiple series in happy publication, she lives in Canada with her patient husband and six demanding cats. 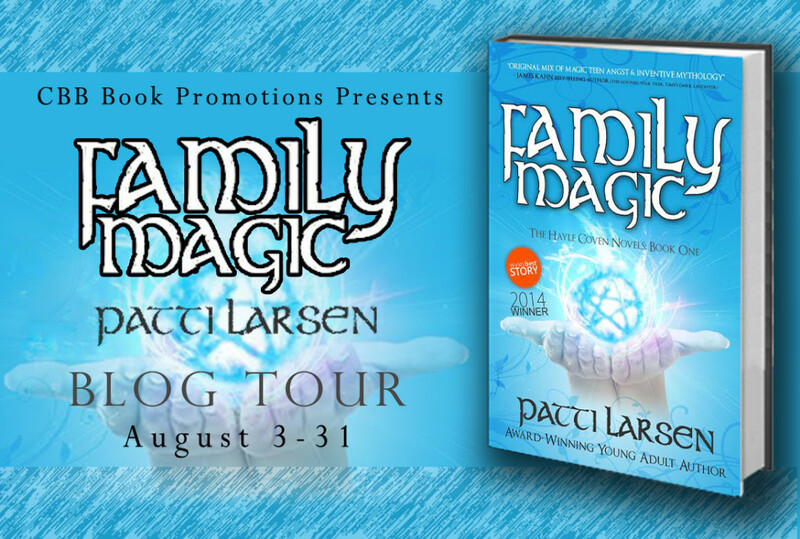 The publisher will be giving away 5 paperback copies of Family Magic (US/CA) and a $25 Amazon gift card (INT) to the winners of the below Rafflecopter. The giveaway ends September 6th.